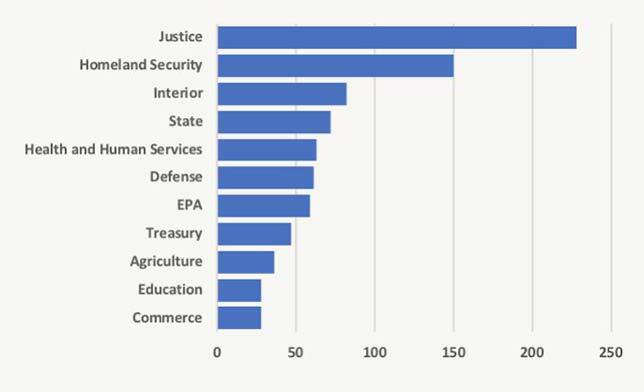 A Freedom of Information Act project measuring the number of FOIA lawsuits filed against federal agencies has added the Department of Education to the top-10 list for the first time. The FOIA Project maintains information on federally related FOIA requests, decisions, appeals and lawsuits. FOIA became law in 1966, under President Lyndon Johnson, to improve public access to government records. The law includes procedures for appealing decisions, and those appeals form the data tracked by the Project. Each year the Project examines the number of lawsuits filed against government agencies, and 2018 is turning into a bumper year. According to the organization, 860 FOIA lawsuits were filed in fiscal year 2018 — a 67 percent increase over the filings made during the last full fiscal year of the Obama administration. The backlog of suits awaiting decisions grew to 1,204. Both measures turned out to be record highs for the past decade. Most were filed by nonprofits and media agencies. While the top agencies hit by FOIA suits remained Justice and Homeland Security, the U.S. Department of Education has joined the ranks. This year, the agency was sued 28 times. Media site Buzzfeed had submitted a FOIA request for records relating to Title IX investigations at six schools. The National Student Legal Defense Network wanted to see records provided by the agency to student loan operator Navient Corp., Navient Solutions and collections agency Pioneer Credit Recovery in response to discovery requests issued in connection with litigation brought against the companies by the Consumer Financial Protection Bureau. In all of these cases, the agency acknowledged receipt of the requests but offered no further communication, leading to the filing of the lawsuits. The FOIA Project is administered by the Transactional Records Access Clearinghouse (TRAC), a joint research center of the Newhouse School of Public Communications at Syracuse University and Whitman School at Syracuse University. Details of the lawsuits can be found through a search feature on the FOIA Project website.